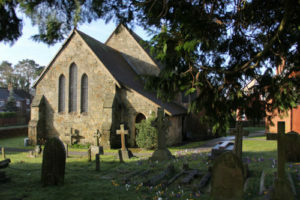 The church was built in 1841, originally consisting only of the present nave, and began life as St. Stephen’s Chapel within the Parish of Frensham. A tower was incorporated in the planning; and nave and tower were completed in 1846, being consecrated on 24th March by the Rt. Rev. C. R. Sumner, Bishop of Winchester. Alfred, Lord Tennyson of Aldworth and Farringford, (Aldworth was the name of the house he built in Haslemere, on Blackdown, where the poet lived until his death in 1892) was associated with the financial support of the project; but the person primarily concerned with the development was James Simmonds (1784-1868), Master Paper-Maker, who owned Sickle Mill and lived at Cherrimans. His diaries (recently published by the Tabard Private Press) mention a number of occasions when he visited people to discuss how money could be raised. It seems that if people wanted a church they would have to be prepared to pay towards its cost – and the gifts that came were not merely in cash. In a manner reminiscent of the people of Israel giving towards the building of the temple, we can read an entry from James’ diary for 16th August 1841 ‘Mr Harding will bring over rafters for the new church, given by Mr Davidson’. A copy of some of the diaries may be viewed at the Haslemere Educational Museum on Tuesdays. James Simmonds is buried beside his wife Charlotte in the churchyard. His son James, Justice of the Peace, was Churchwarden at the time of the Diamond Jubilee celebrations of Victoria’s reign, in 1897. In 1848, Charles Candy was appointed priest-in-charge. 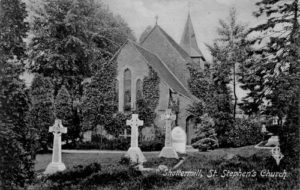 The Parish of Shottermill was divided from the Parish of Frensham in 1875, and Charles Candy was appointed the first Vicar. He remained in charge of the parish for thirty six years – the longest incumbency of any minister to the parish. Also around 1875, J. W. Penfold, a well-known local architect, added the chancel and north vestry and renewed the roof and buttresses of the nave. The estimate was for £1,000. The builder was Pink of Milford, and the church was reopened on 22nd June 1876. The church continued to grow by degrees. In 1879 the south porch was built, and in 1884 Rev. George Purdue began his twenty years of ministry to the parish. On 10th September 1902 a faculty was granted for the erection of a baptistery to the south of the tower and choir-vestry to the north of it. Finally, in 1909-10 the north aisle (Lady Chapel) was built, donated by Mrs Turner in memory of her husband Robert Turner, former Churchwarden. The lady chapel was consecrated in 1917. 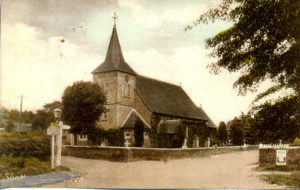 In 1927 the division of the Diocese of Winchester occurred, and Shottermill Parish became incorporated into the Diocese of Guildford. 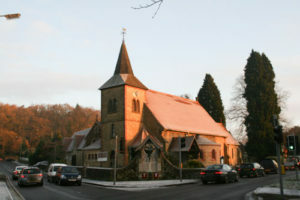 Today, the Parish is a constituent of the Godalming Deanery, in the Archdeaconry of Surrey, in the Diocese of Guildford. Recently the church has undergone significant internal modification following completion of the first phase of its Church Building Project. The most obvious result of this has been the modernisation of the church to include underfloor heating, a Baptismal pool and much greater flexibility in seating arrangements. The new church configuration appears in our Church photographs along with more historical photographs. 2019 Rev. Jenn Riddlestone Vicar.